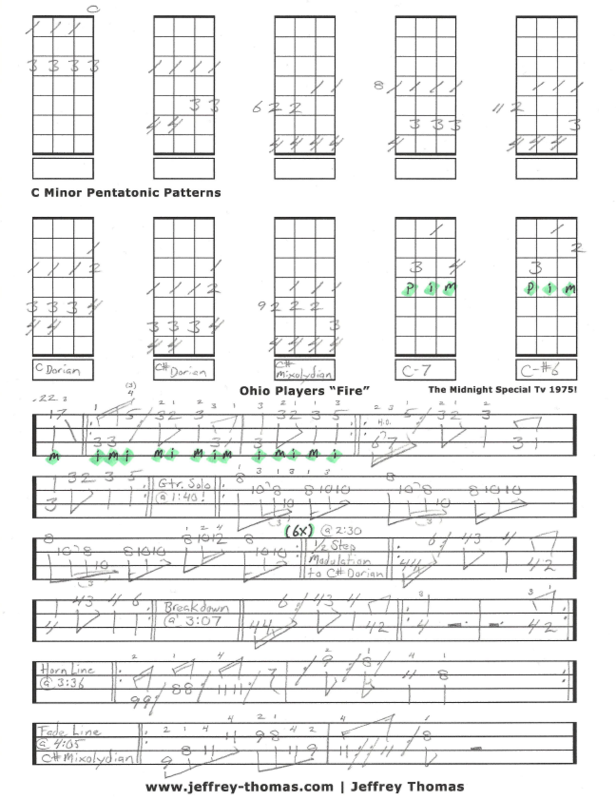 Learn to play the classic 70’s track by The Ohio Players on bass with my Fire bass tab. In this free bass tab and video lesson you will learn the “Pick Up” explanation, detailed right and left hand explanations, C dorian, C# dorian, C# mixolydian and all five C minor pentatonic patterns. I also wrote the guitar solo for bass, modulation to C# dorian, breakdown, horn line, C# mixolydian fade line. Practice and technique details clearly demonstrated so you can be sounding great fast. Want the bass tab for free? Just send in your email address using the form provided. Looking for online bass lessons? Fill out the Schedule A Free Lesson form to set up your free Skype bass lesson today. This tune hit #1 on the Billboard Hot 100 charts in early 1975. Make sure to check out my online bass video archives for more cool, unique bass material.